Wear this inspirational mountain bracelet as a reminder to be brave and courageous when facing challenges on your journey through life. The mountain design is hand drawn and cut from copper sheet and soldered to a copper background. 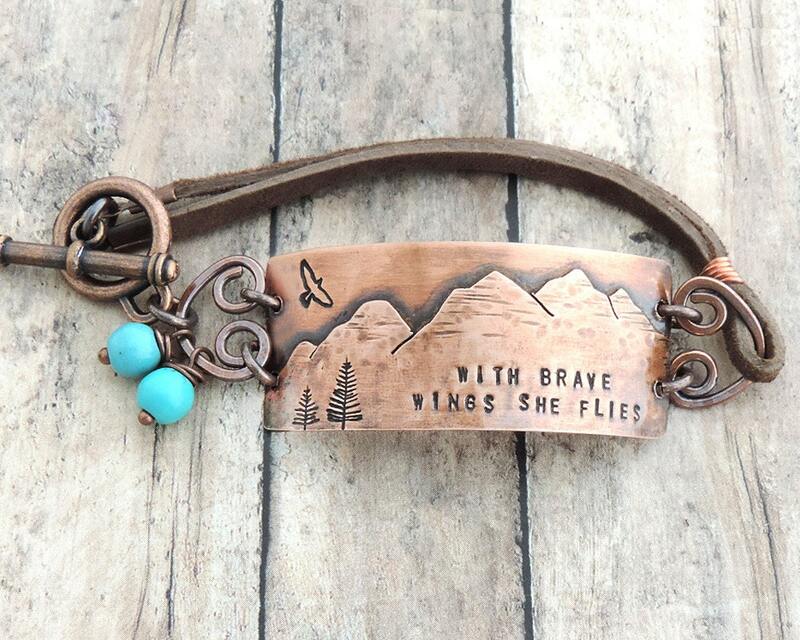 It is stamped with the brave quote along with pine trees and a bird in flight. ► 22 gauge copper tag measures 2" x 3/4"
Select BRACELET LENGTH by adding 3/4" to your wrist measurement. If you're unsure of the length, the average bracelet length is 7". VERY fast shipping and beautiful bracelet! Beautiful bracelet, I’m sure it will be a much appreciated Christmas gift. The bracelet is even more beautiful in person than it is in pictures. It was promptly made and shipped. Seller answered all questions before purchase quickly. Thank you so very much!